Integrated cooling module, DBH-022, facilitates installation/removal of 14-pin butterfly laser packages for quick power on inspection, repair, burn-in, or integration into end products. Solution combines OEM fan mounted heatsink HS-022 with two 14-pin butterfly mounting boards model BA-01. Thermal resistance of 0.22Â°C/W translates to less than 15Â°C temperature rise over ambient when loaded with two pump lasers, which can be mounted or removed independently. Elite Thermal Engineering, a leading supplier for laser cooling solutions, introduced model DBH-022, an integrated cooling module with dual high power 14-pin butterfly mounts. DBH-022 is designed for 14-pin butterfly pump lasers with integral thermoelectric cooler (TEC) or uncooled 14-pin butterfly packages that don't require temperature stabilization. DBH-022 combines ETE's popular OEM fan mounted heatsink HS-022 with two 14-pin butterfly mounting boards model BA-01 to provide a powerful, convenient and cost effective solution for high power 14-pin butterfly pump lasers testing, burn-in, evaluation or integration into laser products. DBH-022 boasts a low thermal resistance of 0.22ºc/w, which translate to < 15 ºC temperature rise over ambient when loaded with two most powerful pump lasers on the market. The two BA-01s can be mounted or removed independently. The 14-pin butterfly mounts on the market today are designed for low power diode packages in telecom industry and the connections are limited to few particular brands of diode/TEC controllers. Most end users have to design their own PCB to interface with the 14-pin butterfly package, and it is very inconvenient to test 14-pin butterfly packages. All the 14-pin butterfly mounts available on the market today have very limited cooling capacity because they are not actively cooled. There is no high power 14-pin butterfly mount available on the market today that can remove the heat generated by high power pump lasers. ETE's DBH-022 makes it easy to conveniently install/remove high power 14-pin butterfly laser packages in minutes either for quick power on inspection, repair, burn-in, or integrating it into the end products. DBH-022 is developed with users and customers' products in mind and it offers a perfect OEM solution for integrating high power pump diodes in laser products. Users can mount 14-pin butterfly laser package on the heatsink directly. 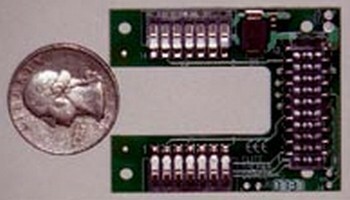 The electrical connection is facilitated with a simple clamp that gently presses the 14-pin butterfly contacts to spring loaded ZIF connectors on BA-01, all contacts are routed to a 20 pin connector that interfaces with user harness for connecting to diode and thermoelectric drivers. Mating connector information is provided in ETE's DBH-022 datasheet, and ETE offers custom cable harnesses to customers as an accessory. Please visit www.elitethermalengineering.com today for the most up-to-date datasheets of all ETE's products, or email contact@elitethermalengineering.com to obtain the product detail information.